Piñata Farms has declared the 2018/2019 Honey Gold mango season its best yet in terms of appearance and shelf-life quality, 10 years after sending the first commercial volumes to market. Key account manager, Rebecca Scurr, said fruit quality - especially skin appearance - was consistently exceptional throughout the season due to the efforts of some 30 contracted growers around Australia. Dry lead-in conditions were also optimal for mango production. "Despite variable regional conditions, our growers collaborated to implement best practice growing and harvesting techniques. Their efforts resulted in the best quality mangoes we have produced to date and meant less fruit had to be re-graded," Ms Scurr said. "Some growers have been producing Honey Golds since the variety was first available in 2002 and are now highly experienced. Other newer growers, have quickly adapted proven growing practices to achieve consistency as evidenced by feedback from retailers and our customer base. "Pruning is an essential factor in keeping trees healthy because it keeps disease out and lets sunlight in to strengthen trees. "Consistency is key to winning consumer loyalty. It's important that Honey Golds look and taste great all the time, no matter where they are grown." She said the packhouse seasonal output was equal to Piñata's record volume achieved in 2017/2018. The last Honey Golds for the season, are being harvested in Western Australia, for local distribution. Ms Scurr said the progressive harvest which starts in the Northern Territory and ends in Western Australia, was unaffected by localised flooding in Far North Queensland earlier this year. "Most regions experienced dry conditions leading up to and during the harvest - ideal for growing mangoes. Rain in November held the Northern Territory harvest up by a few days and the Bowen, Queensland harvest was delayed a few days but this had no impact on quality as grower agronomic upkeep was excellent. When it flooded in Far North Queensland, the harvest was already over, so again there was no impact." Ms Scurr said new live-scanning software implemented at provider LaManna Premier Group's (LPG) ripening facilities had further tightened quality control and traceability. Honey Gold mangoes are ripened by LPG nationally, assessed within 24 hours and transported to the nearest supermarket distribution centres. All facilities now feature software developed by New Zealand horticultural software provider, Radfords. 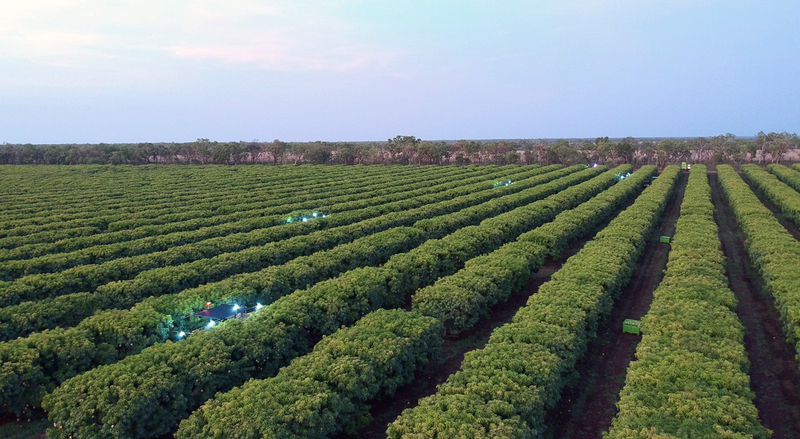 "The software scans every single tray live and provides traceability data which can tell us when fruit was picked, where it was packed and where it has been sent so we can track and trace product as it moves all over Australia throughout the season. We want to ensure we've done everything we can to make our fruit safe," Ms Scurr said. She said many growers continued to expand Honey Gold plantings and introduce technologies to enhance production. "We expect to see a significant shift in the implementation of new technologies such as autonomous picking in the next five years," she said. Central Queensland third-party grower, Groves Grown Tropical Fruit of Yeppoon, has collaborated with Central Queensland University's Professor Kerry Walsh and his research team for several years to test technological advancements in mango production. Grower Ian Groves said two major technologies tested were an autonomous harvester and a scanning system which patrolled the orchard at night to monitor flowering and predict maturity at harvest. "The autonomous harvester, which picked fruit on our farm this season, is now only a few years away from being available to mango producers. Affordability will be a key factor, moving forward," Mr Groves said. "The scanning system is GPS-located and can count the number of mangoes in a block and what size they are, to within five per cent accuracy. This will be a game changer in mangoes as it will help growers plan their harvests and book their labour based on fruit quantity," he said. Groves Grown Tropical Fruit has produced Honey Gold mangoes since before Piñata Farms acquired the breeding rights. It started with 1,000 trees and has continued to plant more over time. By 2023, some 6,300 trees will be in full mature production. Piñata Farms and its growers produce mangoes from more than 170,000 trees in five states for national distribution between November and March. Piñata Farms will host the annual Honey Gold Congress in Katherine from May 10-12. Key Piñata Farms personnel will also attend the 12th Biennial Australian Mango Industry Association's annual conference in Darwin from May 14-17. In other developments, Piñata Farms was named Horticulture Farmer of the Year at The Weekly Times Coles 2018 Farmer of the Year awards in February. Managing director Gavin Scurr has also been appointed to the NT Farmers' Association board, which Ms Scurr said was a boost for Piñata's business and specifically the Honey Gold brand. "We have a vested interest in the Northern Territory because we grow both mangoes and pineapples there," she said.